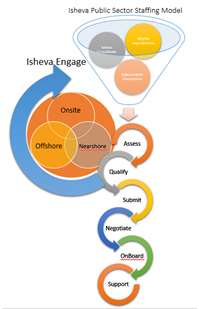 Isheva is qualified under numerous Supply Arrangements (SAs) and Vendor of Records (VORs) for various levels of government including the Government of Canada (GoC) and the Government of Ontario. Where we do not have contract vehicles in place we have aligned ourselves with consulting firms that do. Regardless, public sector organizations seek our expertise in direct Government Services,Health, Utilities, Transportation, Justice, Education, Not-for-Profit sectors.